We all have experiences that have turned into incredible memories filled with meaning and emotion, but how many of those are related to our spiritual journey? As we grow spiritually and seek to pass on our faith to the next generation, we can use some “altars of remembrance” to celebrate God’s faithfulness in our lives. 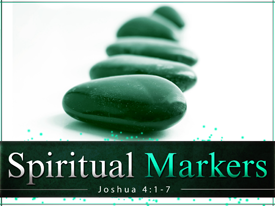 Spiritual Markers is a 3-hour seminar that provides a biblical foundation of markers and very practical ways to make these spiritual movements memorable. This seminar is for anyone who desires to be intentional about marking spiritual turning points in their life and in the lives of the next generation. To request more information, leave a reply below. For more information on Spiritual Markers, check out www.spiritualmarkers.com. Parents across the country have expressed an urgent need for help in navigating the complex issues they face in trying to raise godly children. In response, Real World Parents (RWP) has designed a 3-hour seminar to give them the Biblical principles and practical tools they need now. This seminar is for Christian parents with children of any age, no matter where their family is on their spiritual journey, and I believe it will bring about much-needed conversations and essential life change. Click the image above to learn more. Andrew Hedges came to our church to help parents better understand how to make Christ the center of their homes and lives. The two greatest things our parents left with were great practical insights and a confident “We can do this” outlook. We will be having Andrew back next year! Thanks for the feedback, Shawn! I hope everyone who sees this will check out Six11 Ministries and see how God is using you.